West Australian midfielder Jaeger O'Meara has signed a new four-year deal with Hawthorn to take him through to the end of 2023. The 25-year-old is in his third season with the Hawks and has career-best numbers so far. Before missing Sunday's defeat to St Kilda with a hip injury he had averaged 28.7 disposals (11 contested), 7.7 tackles and 5.7 inside 50s. He sets a great example for his teammates with his professionalism and work ethic. O'Meara won the AFL Rising Star award in his first AFL campaign with Gold Coast in 2013, as well as being named best first-year player by the AFLPA. He played every game for the Suns in his first two seasons but a patella tendon injury sidelined him for the whole of 2015 and 2016. The Hawks gambled that he could overcome his knee problems when they traded him in during the 2017 AFL Trade Period, swapping that year's No.10 pick and a future second-round choice for him. Though injuries restricted him to just six games in his first season he played 21 times last year. O'Meara, who is leading a depleted Hawks midfield this season, has been rewarded for his increased durability and outstanding start to the season. Hawthorn football boss Graham Wright said: "He's become such an important player for us, not only through his on-field performance but also from a leadership sense as well. 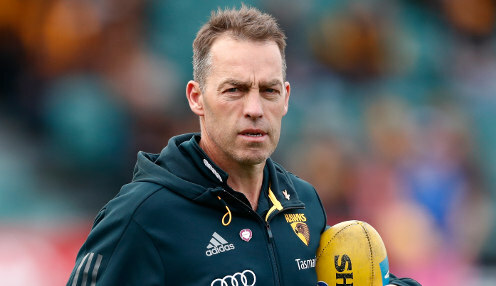 Alastair Clarkson's team, who finished fourth on the ladder last year and were knocked out in straight sets in the finals, have a 2-2 record so far this season. Hawthorn are 29.00 to win the Grand Final. The Hawks are 2.70 to win their next game against Geelong, who are 1.47.